The living room is the heart of the home, and we all need a little fire in the heart. That’s why it’s always great to have a nice fireplace in our recreation areas. 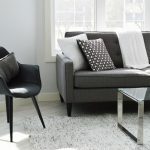 It can be a traditional wood-burning fireplace, or a more modern alternative that works on gas, or even an electric unit – all of these will definitely add more design value to your interior space. A fireplace will naturally become a main focal point for the whole room, so it’s important that it’s designed accordingly. 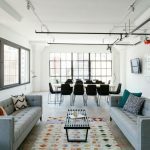 It should stand out as an important design element and should look consistent with the overall interior style at the same time. Stone cladding, marble tiling and brick finishes are all great material choices. Regular wall paint in a neutral or accent color is sometimes also worth considering. Finally, a little bit of decorating should take place to take your design to the next level. One thing you could do is hang a wall art piece over the fireplace – a painting, a clock or even a mirror will do just fine. Or you can decorate your mantelpiece with a fine selection of accessories – vases, candles, photo frames, personal souvenirs… Basically, anything to your liking will do the trick. 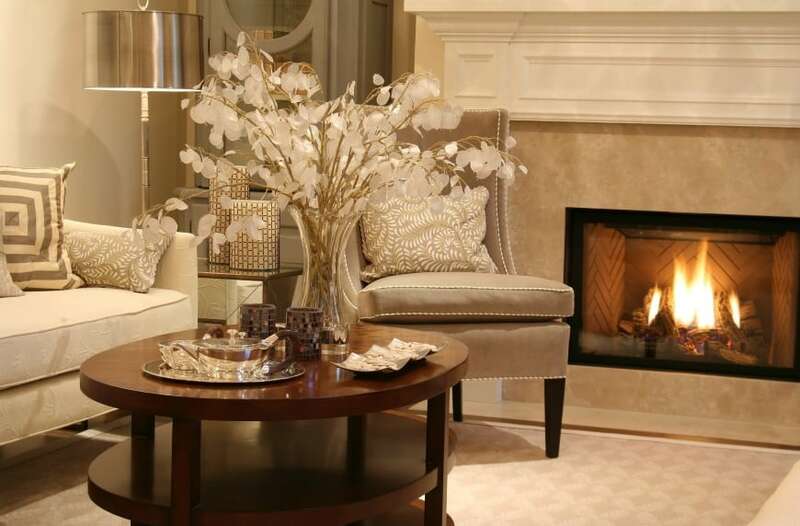 Now, it’s time to take a peek at our collection of beautiful design ideas for living rooms with a fireplace. 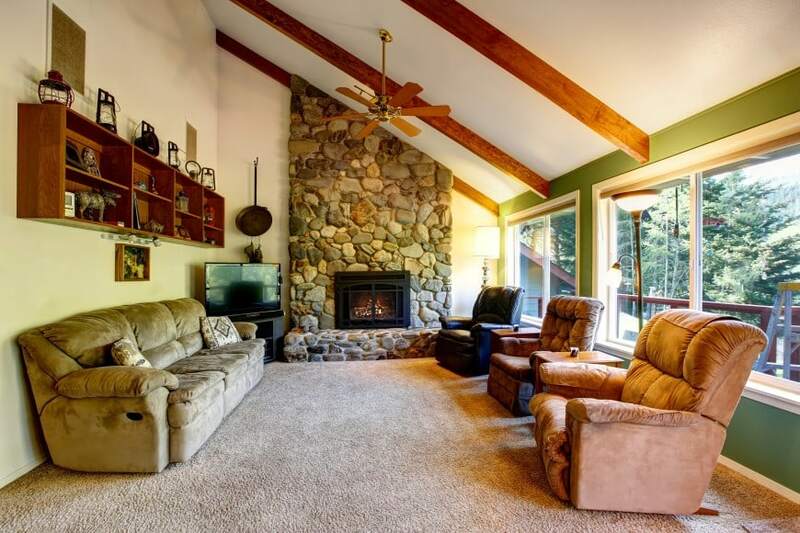 This cozy living room has a comfy sitting area where you can sit down and relax, watch TV and enjoy a beautiful fireplace in action. 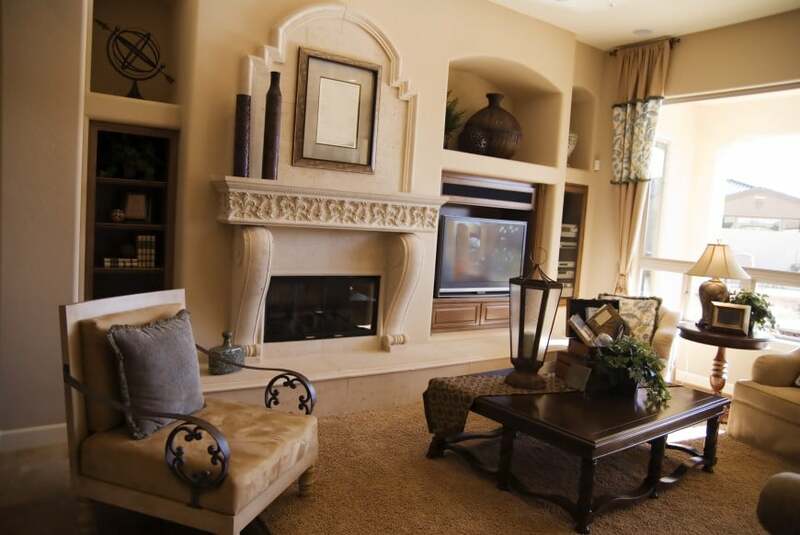 The fireplace is set in stone and is nicely decorated in a way that makes it a perfect focal point. 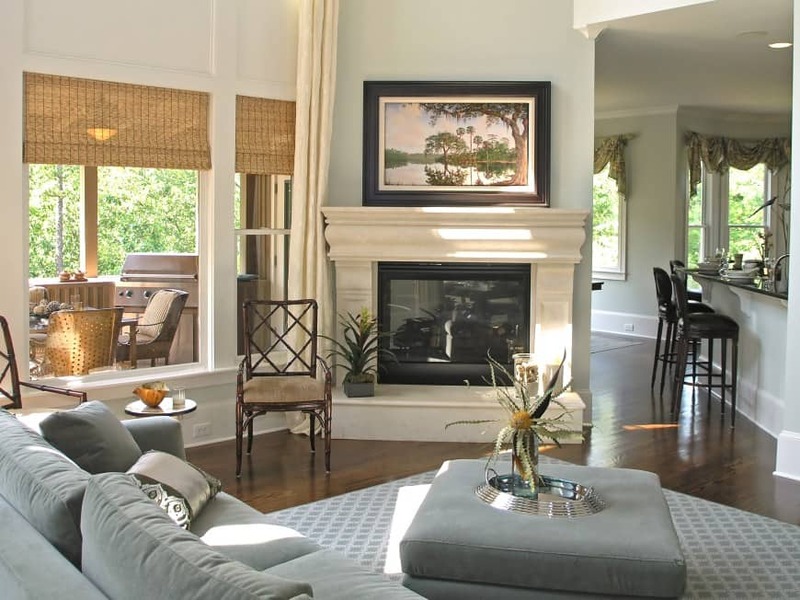 This open concept living space features a prominent fireplace that takes up the center of the room. 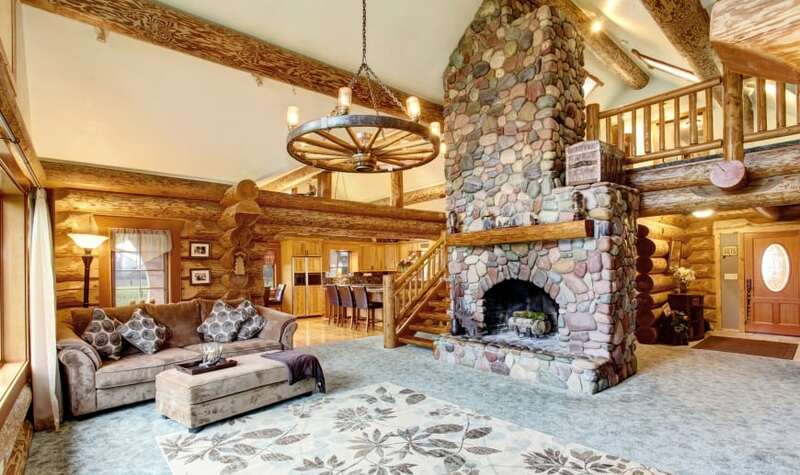 It is set in round stone cladding that matches the round log walls and inspires a heartwarming rustic feel. 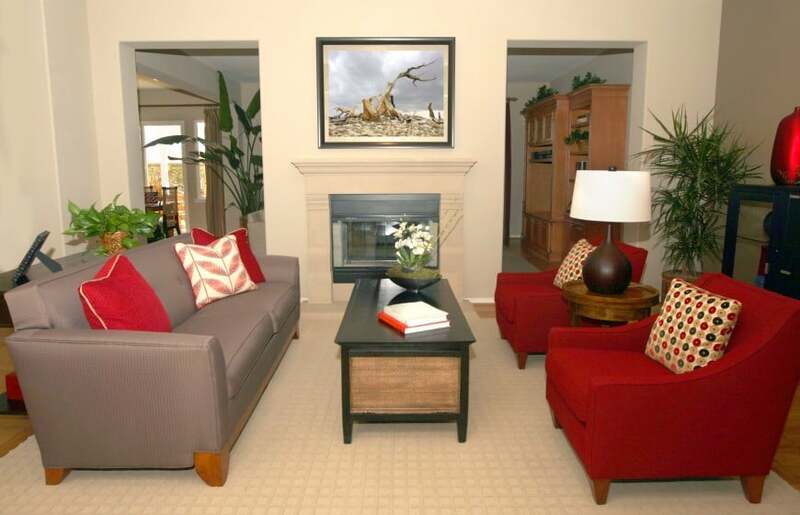 Here is another living room design with a fireplace. The room is designed with a beautiful conversation area featuring a grey sofa and a set of red-colored armchairs. 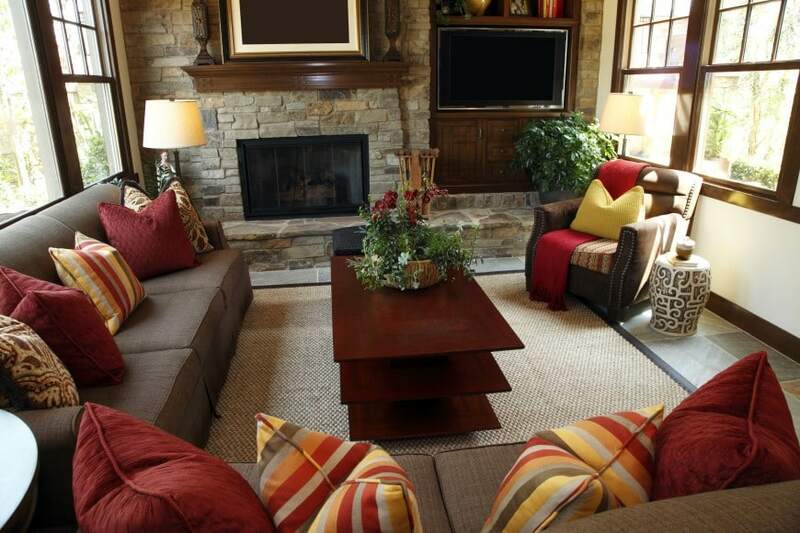 A selection of bright colored patterned throw pillows adds character to the design. 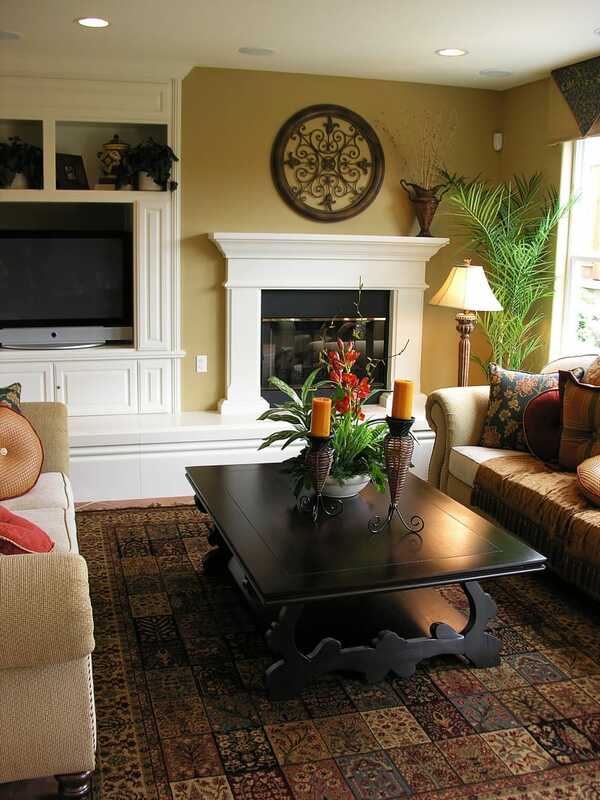 Here is another cozy living room design idea. With an orange-colored accent wall and plenty of green indoor plants this design certainly gives off a cheerful vibe and is full of life. 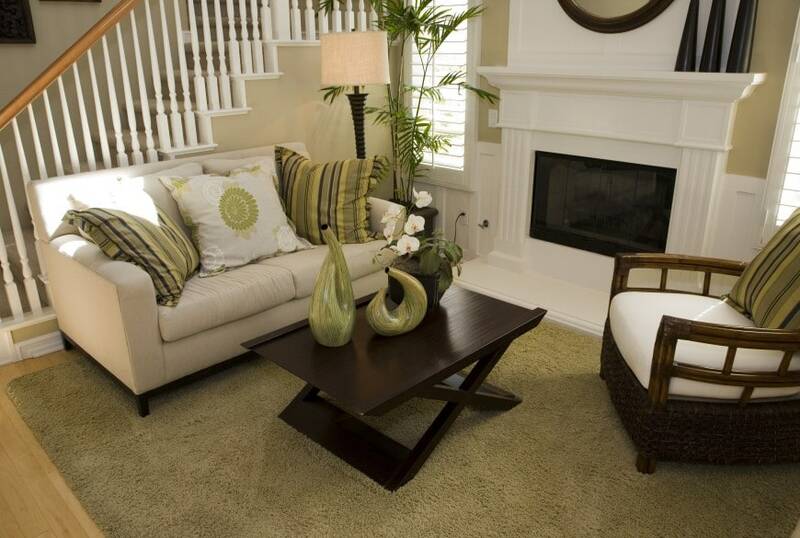 The shaggy area rug is another great addition to the interior space. 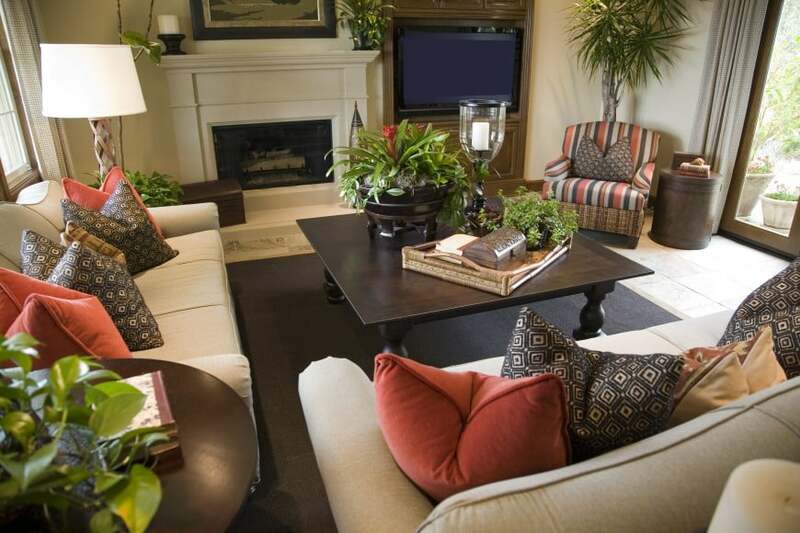 Have a look at one more living room with a great collection of potted plants. It also features a comfortable L-shaped sofa, a round coffee table and a leather seat. 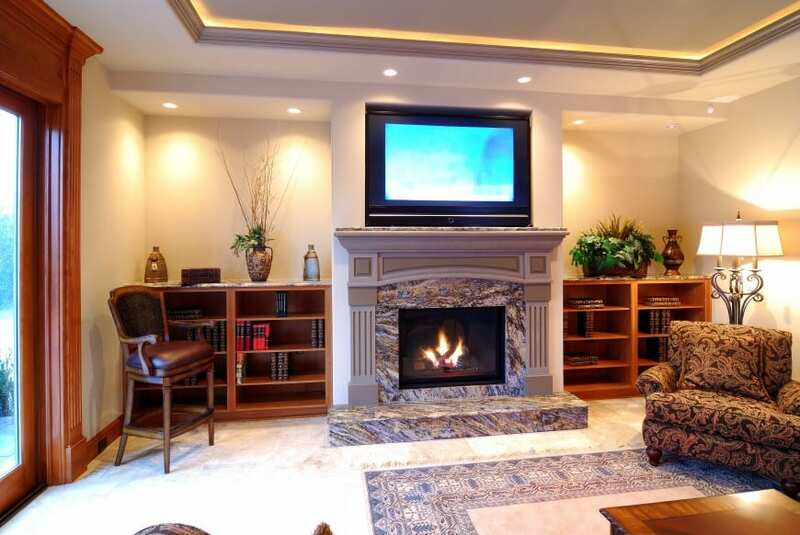 A flat screen TV is also available, but the the fireplace is the main focal point. This modern minimalist interior design is bathed in sunlight coming in through the large windows. The room features a sitting area and a dining area, and a large fireplace that serves as a room divider. Here is another beautiful living room design with a modern appeal. It has vaulted ceilings, large windows, skylights and a stone-clad fireplace that you can enjoy as you sit back in a comfy lounge chair. Here is a more traditional design idea. This living room design has a symmetric layout with a fireplace flanked by a fitted bookcase on each side, and a conversation area complete with two sofas and a coffee table. Here is an exquisite interior design idea in neutral shades. 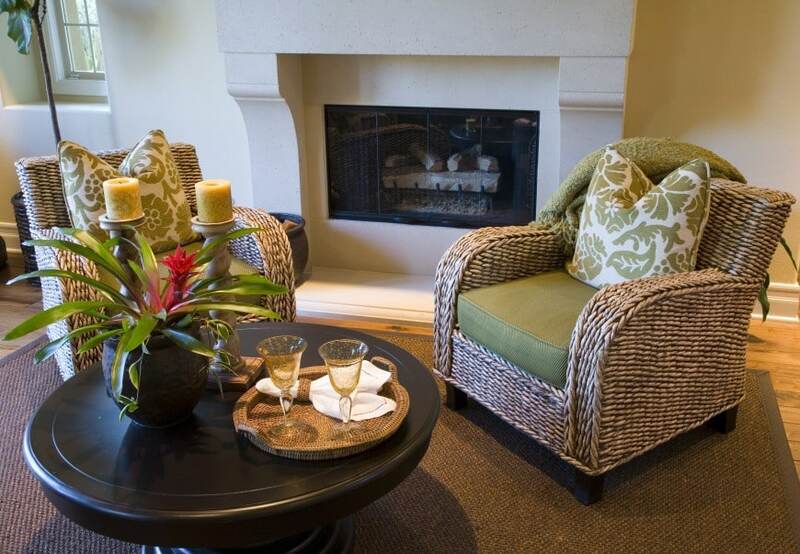 It features an elegant fireplace with a sitting area. A fine selection of accessories adds character to the interior space making it one of a kind. This living room space features a vaulted ceiling, large arched windows and a stone-clad fireplace. Furnishings include a sofa set and a pair of armchairs with a coffee table. A large TV cabinet is also a part of the living room design. 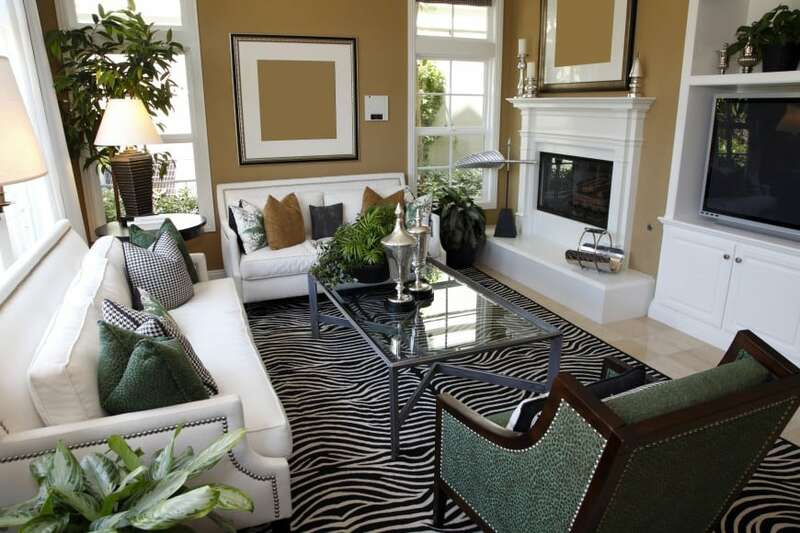 Here is another fine living room design in neutral shades of beige and grey. It features large windows and a grand fireplace. 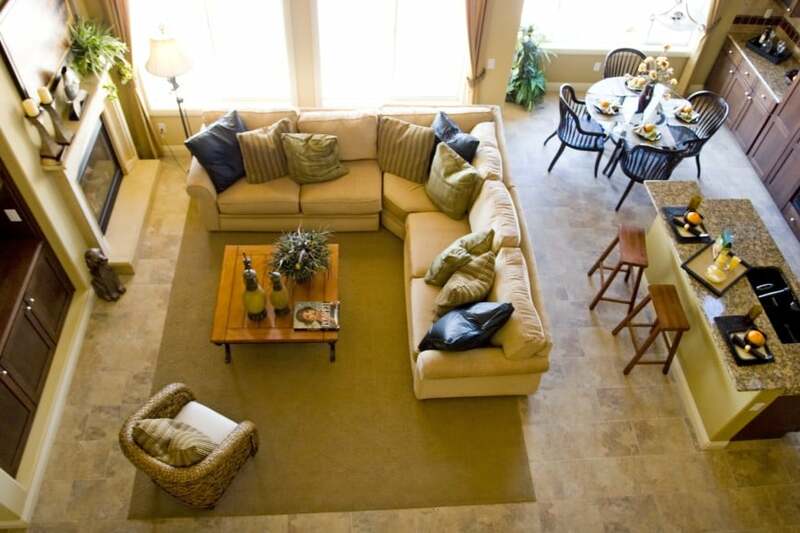 It is furnished with a comfortable sofa and a bunch of round ottomans scattered around. This traditional living room features a sloped ceiling with exposed wood beams, a carpeted floor and a stone-clad fireplace that serves as a main focal point. The landscape view out of the windows also should be noted as it’s another great asset. This cozy living room is set in off-whites and dark wood. 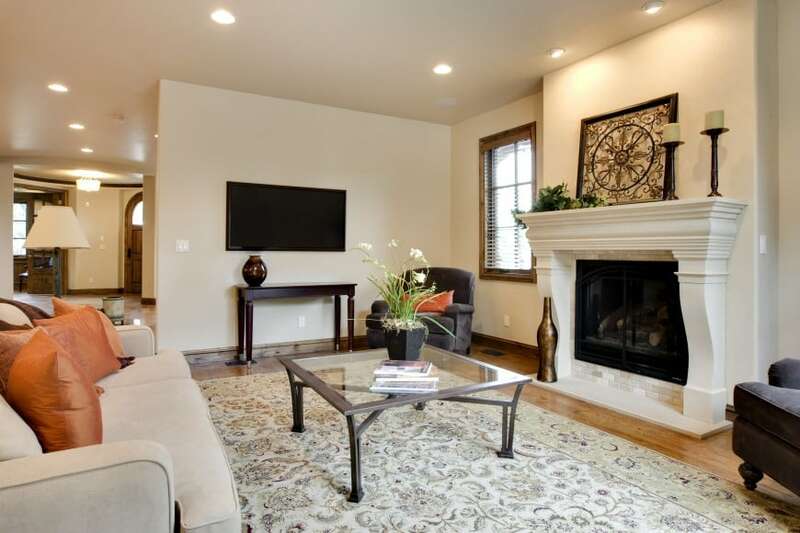 It features a large fireplace with a beautifully decorated mantelpiece and a comfy sitting area. The design is complete with discreet recessed ceiling lights. 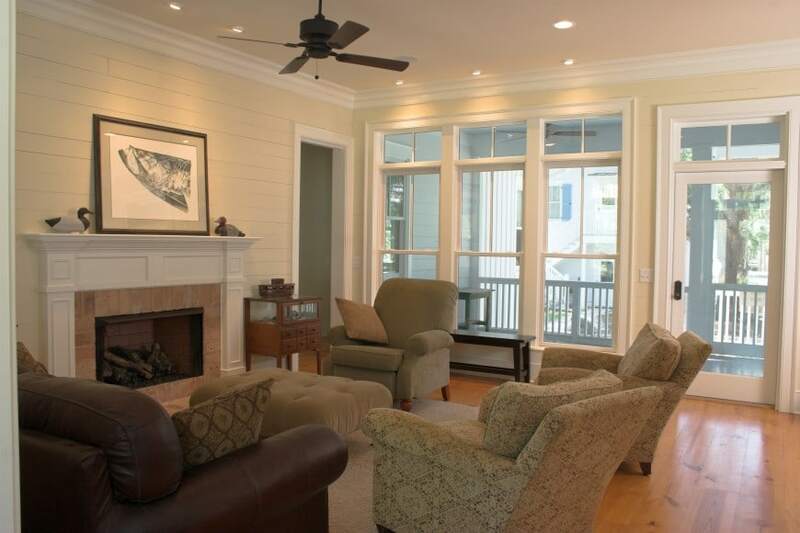 With eggshell-colored walls and a hardwood floor this living room certainly is cozy and inviting. 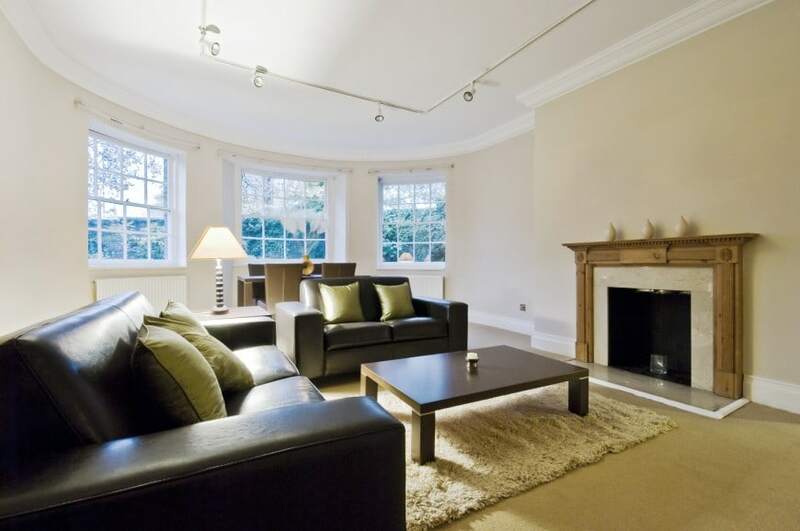 It has a beautiful fireplace and a sitting area complete with a sofa, an armchair and a coffee table with a glass top. 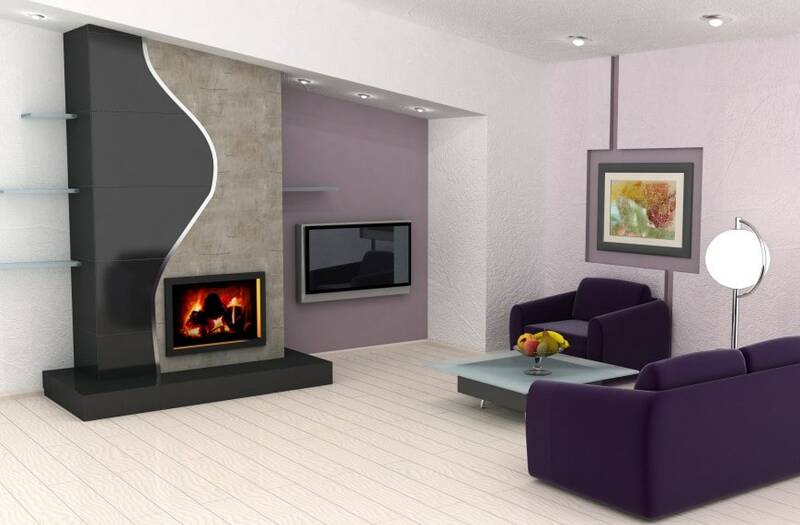 This modern design with purple-colored accents features a tile and stone clad fireplace with a TV niche beside it, and a sitting area complete with a loveseat and a lounge chair. Lighting design includes recessed ceiling lights as well as a modern floor lamp. This exquisite interior design certainly is packed with style. It is rich in texture and detail, and inspires a sense of luxury and high class. 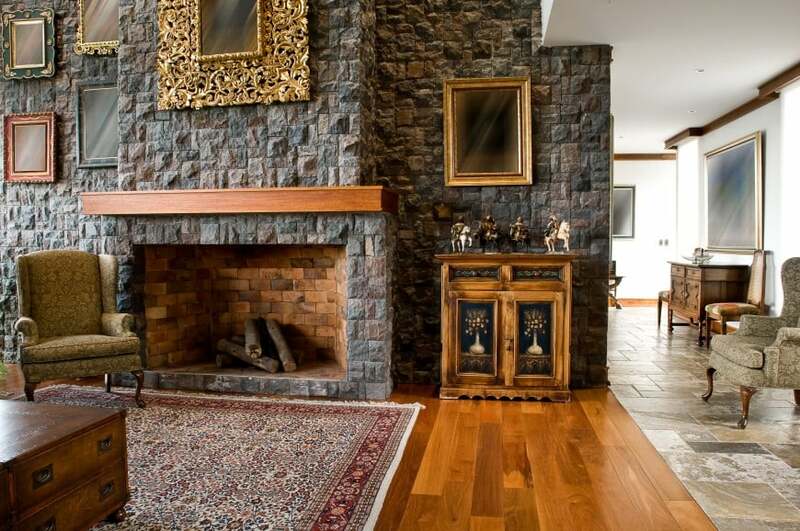 It has a large stone-clad feature wall with a fireplace that makes a great focal point. 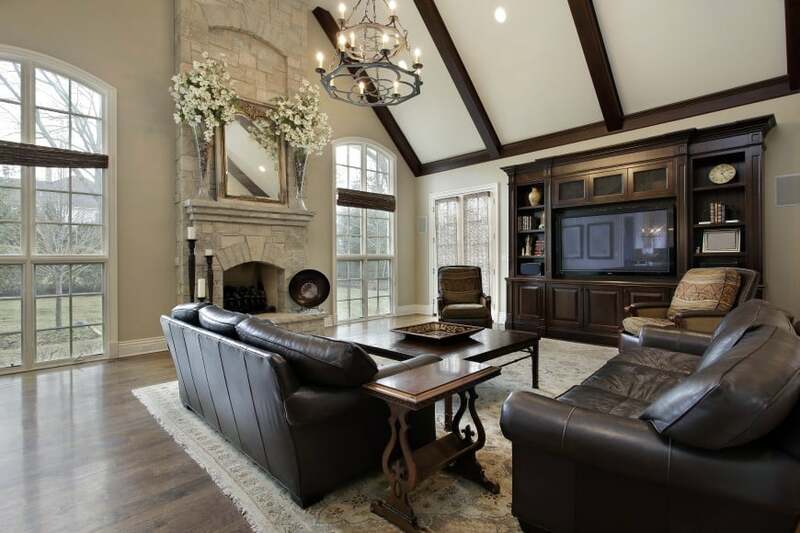 Here is another family room that is masterfully designed. It is set in contrasting off-whites and dark brown. 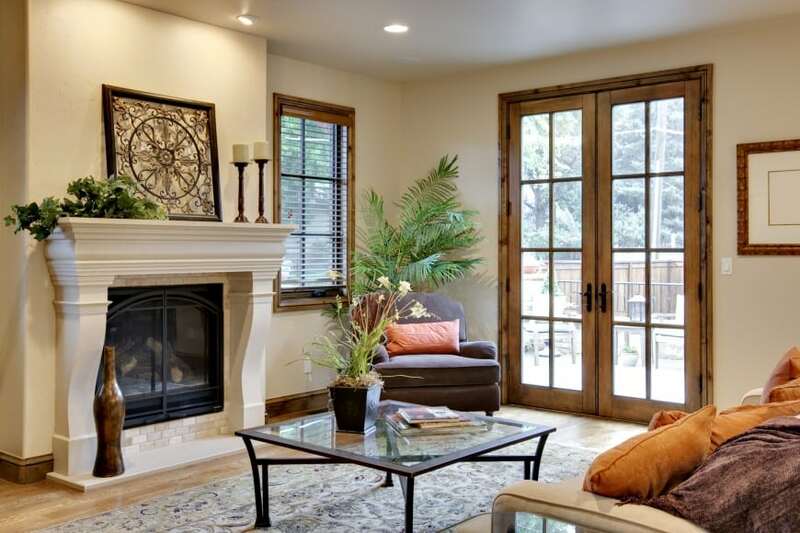 It features french windows, a coffered ceiling and a beautiful fireplace. A wall-mount TV is installed just above the mantelpiece. This living room is nice and snug. It accommodates a sitting area with a couch set and a coffee table. The room features a fireplace with a wall decor piece that hangs over it adding more design value to the setting. Here is an interior space that is oddly shaped. It has an open concept floor plan that accommodates a living room area, a kitchen with a bar counter, and a dining area. An outdoor porch can also be seen through the window. Here is a lavishly decorated interior scene. 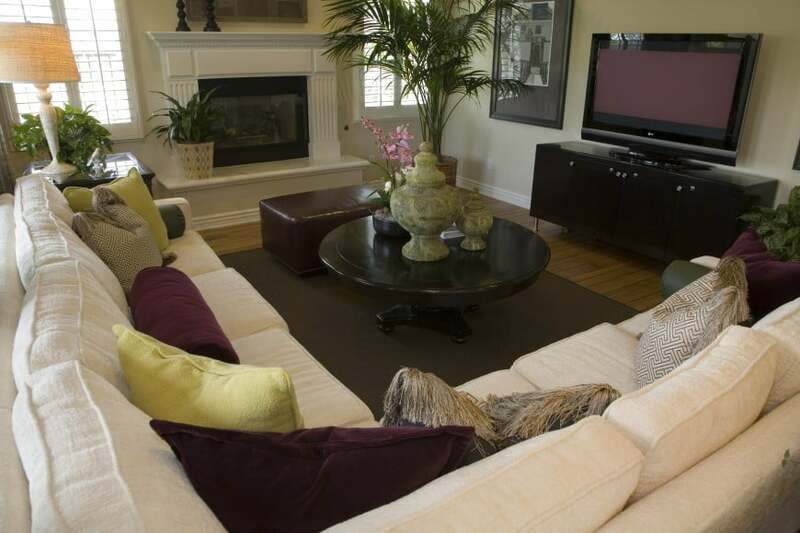 This family room features a fireplace with a sitting area and a whole lot of indoor plants all around. The design is rich in color, texture and pattern, and truly is a pleasure to look at. Here is another cozy traditional design idea with a bunch of indoor plants. 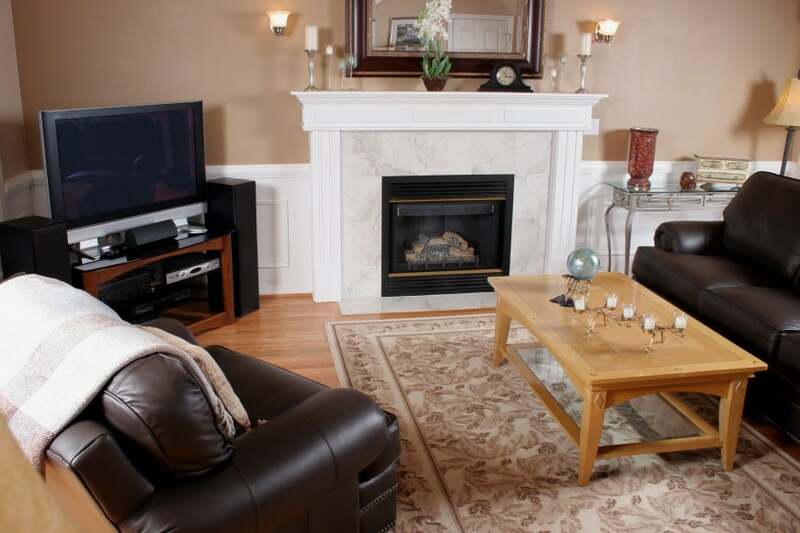 The room accommodates a neat sitting area by the fireplace, and a TV to the side. Seating options include a loveseat, a three-seat sofa and a leather armchair. This spacious living room is sparingly furnished with the basics – a comfortable sofa and set of two armchairs around an oval coffee table made of glass and iron. 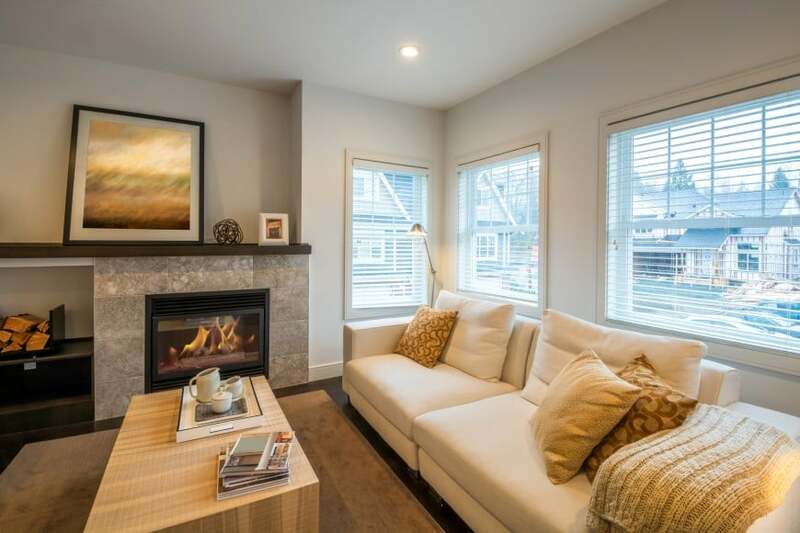 With a sweet little fireplace in it, this living room does not need much else to shine. 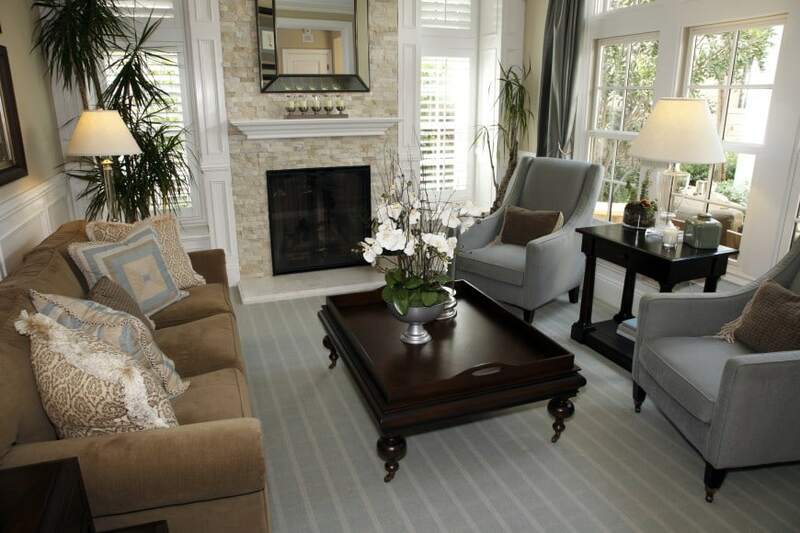 This neat design idea features a fireplace and a set of two wicker armchairs in front of it. 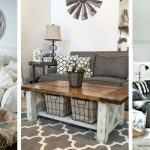 A round coffee table is also available, as well as a plain-colored area rug that certainly makes the whole room feel much more cozy and snug. This family room is filled with light and packed with style. It accommodates a sitting area and a fireplace. The sitting area includes a three-seat sofa and a pair of armchairs with a coffee table and an end table. 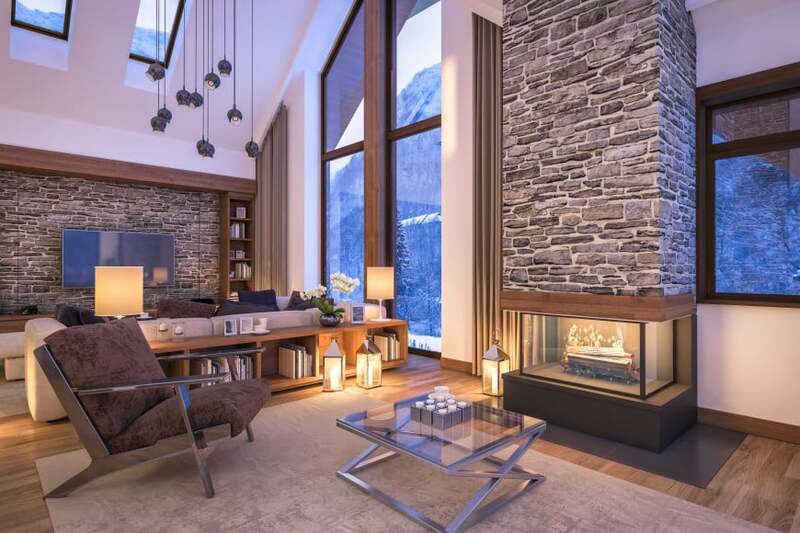 This living room features a granite-clad fireplace with a TV that fits in a niche above. With a fitted bookcase on both sides and accent lighting overhead it makes a great focal point to look at. With a whole lot of potted plants all over the place, this room makes a real indoor oasis. The walls are set in olive green and the windows are finished with matching striped blinds. The all-white fireplace stands out amid all the green. 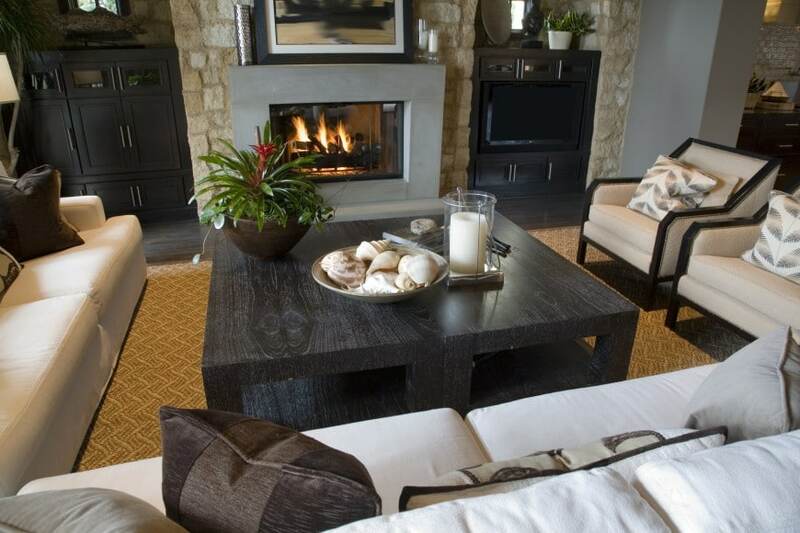 This family room accommodates a neat conversation area around a wood-burning fireplace. Furnishings include a leather sofa and a couple of armchairs with an ottoman table in the middle. The whole room is set in discreet neutral shades. Here is another interior design idea that embraces neutral colors. 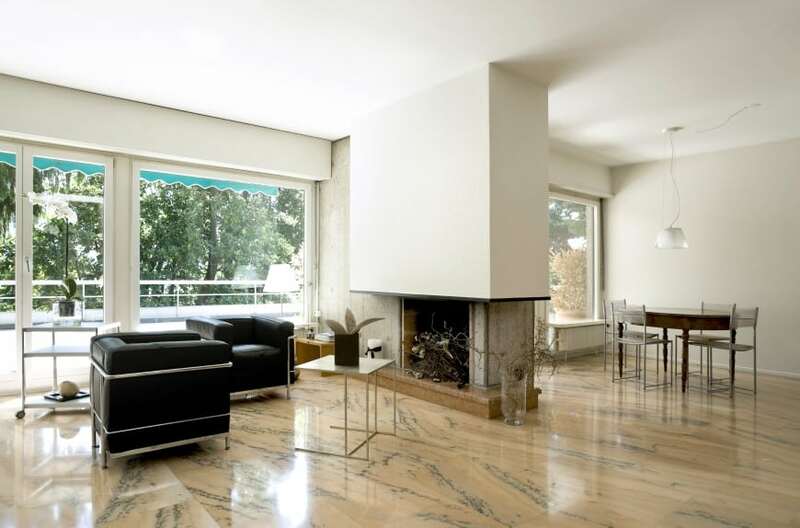 It has a clean modern appeal and features an all-white sofa with a fireplace close by. The fireplace is clad in grey stone that is a great match to the dark-colored hardwood floor. This gorgeous design features a beautifully decorated fireplace with wall niches all around that are a fine alternative to bulky sideboards, as they can easily accommodate a fitted cabinet or can be used to neatly exhibit prized possessions and decorations. Here is another beautiful design set in neutral shades of beige and brown. This elegant solution features a sitting area complete with a pair of coaches and an armchair with a wood and glass table in the center, and a fireplace close by. 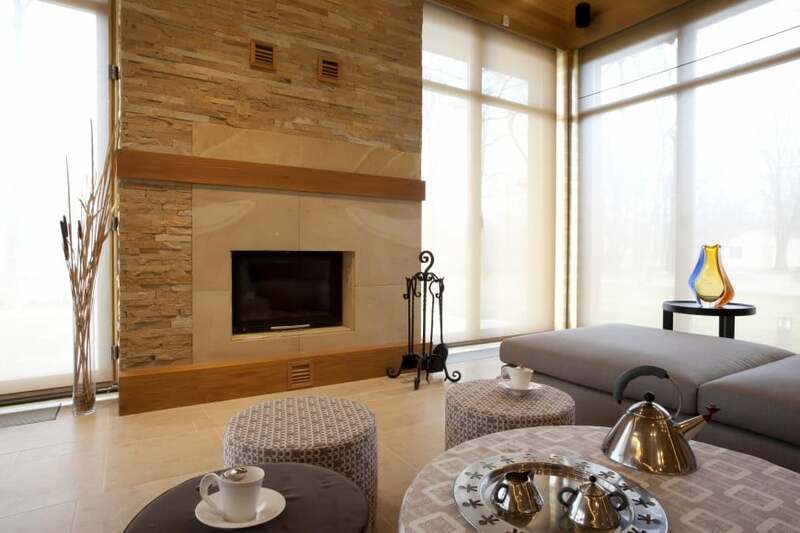 This living room has a fine feature wall with a stone-clad fireplace as a main point of interest. 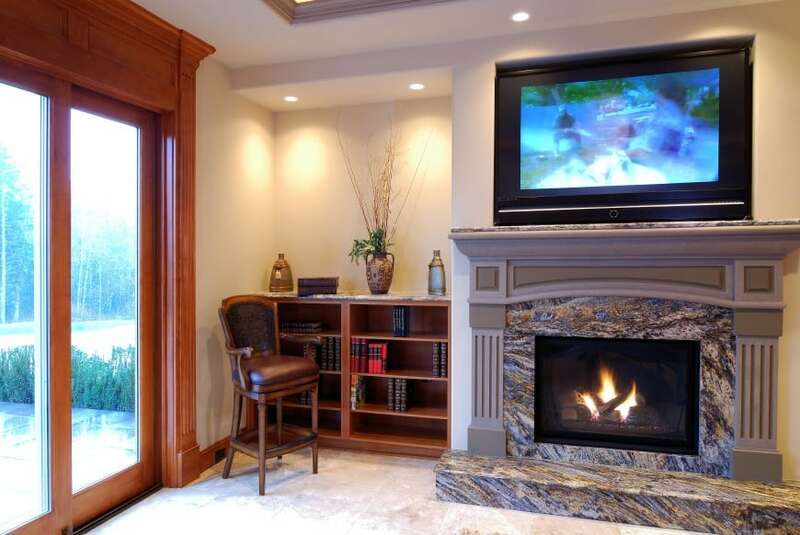 The fireplace has a fitted cabinet on each side, with one of them accommodating a TV. Naturally, a comfy sitting area is also designed in the room. Have a look a cozy little sitting area featuring a loveseat and an accent chair. The room is decorated in olive green that helps create a relaxed setting. 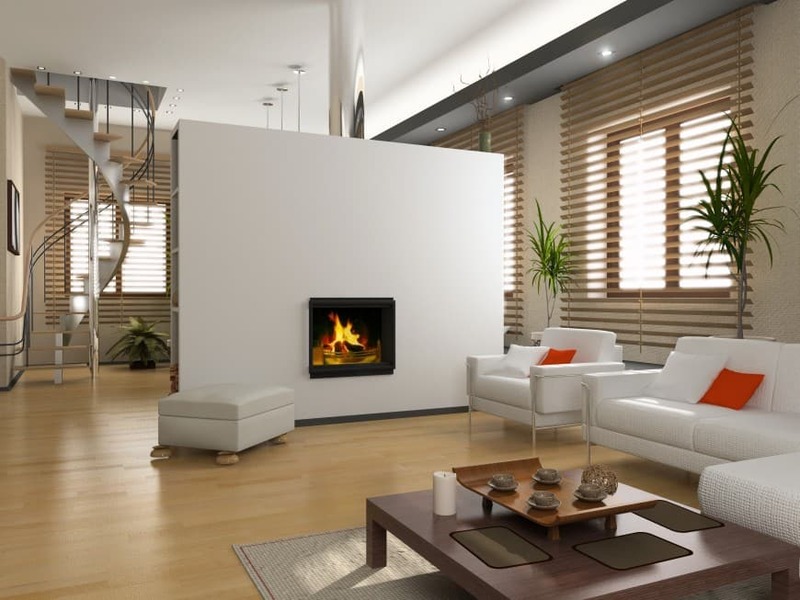 The nearby fireplace also is a great asset to the interior space. 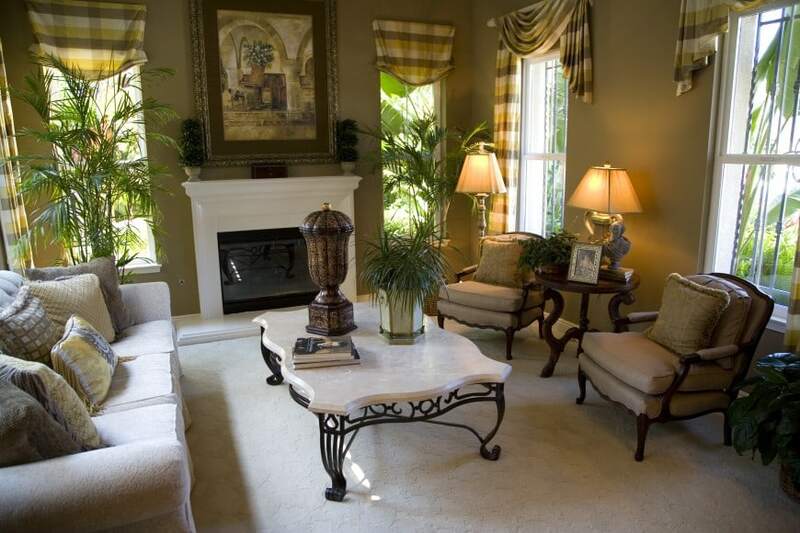 Here is a traditional family room that is quite nicely decorated. It features a comfy sitting area, a fireplace and fitted cabinets. The design is complete with a whole bunch of throw pillows, potted plants and all kinds of interior accessories. Have a look at this interior design set in wood and stone. It has a traditional appeal that embraces bold red and yellow accent colors that personalize the space and add character to it. 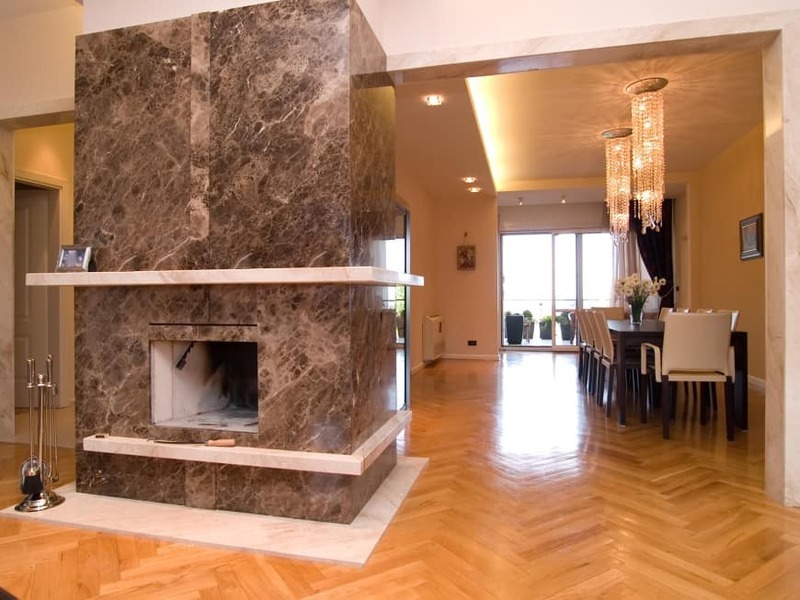 This modern design features a herringbone parquet floor and a prominent marble-clad fireplace that takes up the center of an open-concept main floor and makes a great focal point that can be viewed from each and every part of the room. Here is a more simple take on living room design. It features a basic sitting area complete with a sofa set in black leather, a square coffee table and a fireplace. A track lighting system runs along the ceiling. 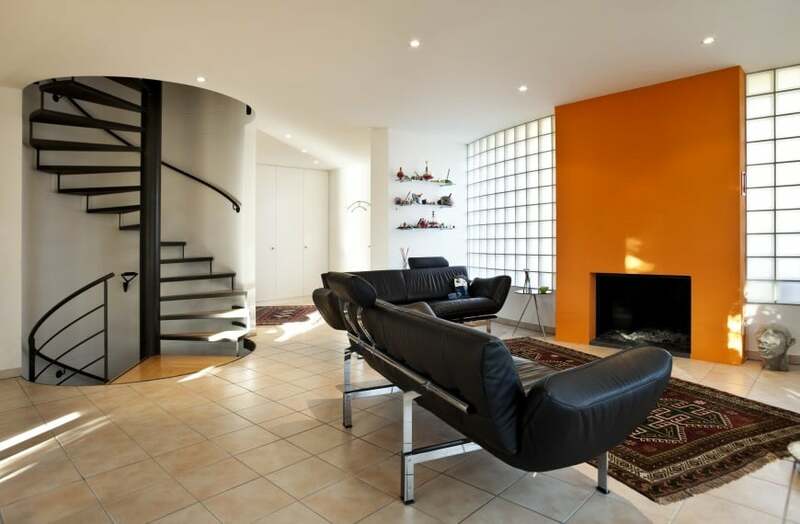 This modern design has a bold feature wall in orange that strikes the eye at first sight. 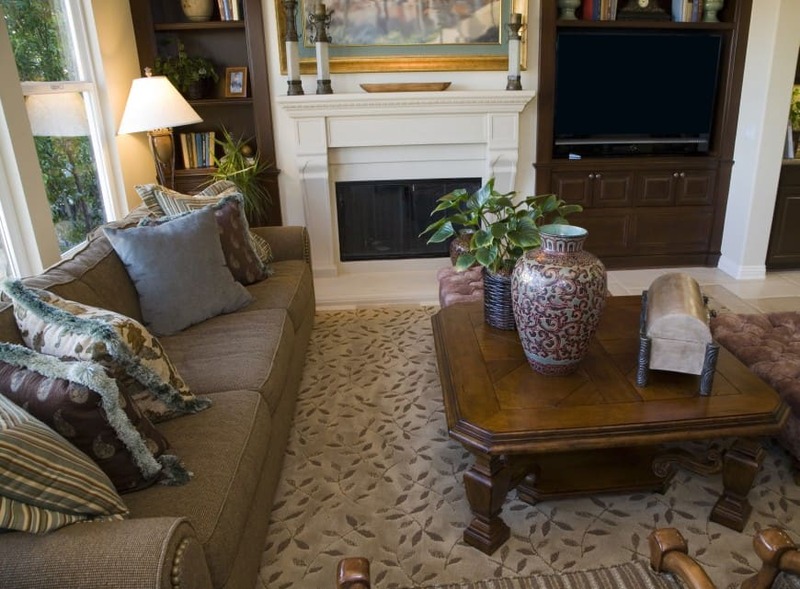 A modern set of leather sofas forms a neat conversation area complete with a classic area rug. Here is another contemporary design proposal. 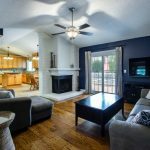 It has an open concept floor plan that accommodates a sitting area and a dining nook separated with a room divider unit that features a built-in fireplace. Here is another modern design idea. 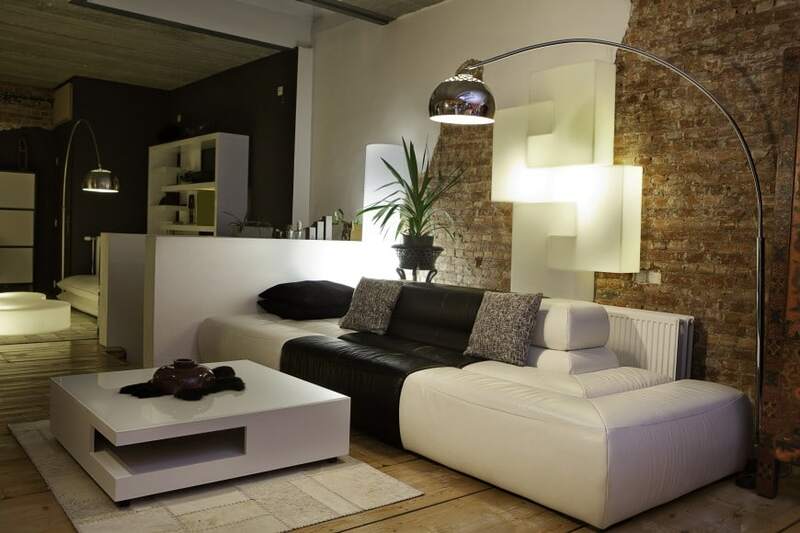 It features a black and white sofa with a square coffee table and an arched floor lamp in shiny chrome. Stone cladding on the wall behind the sofa adds texture to the design. This modern living room is great for hanging around with the whole family and friends. It accommodates a large U-shaped sofa and a set of mixed size and color ottomans. 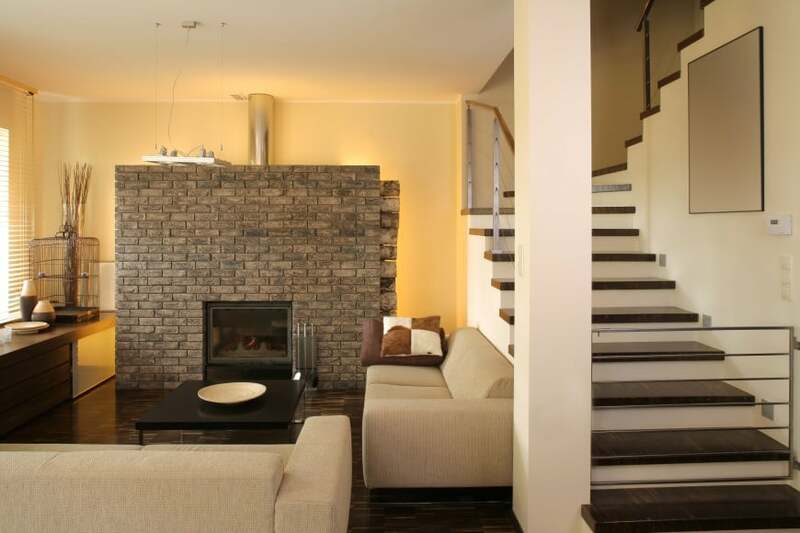 A stone clad feature wall with a fireplace is the main focal point here. Here is another large family room design. This interior space is multifunctional as it accommodates a sitting area, a dining area and a kitchen. It also features a fireplace near the sitting area. Have a look at an unconventional design idea set in white. 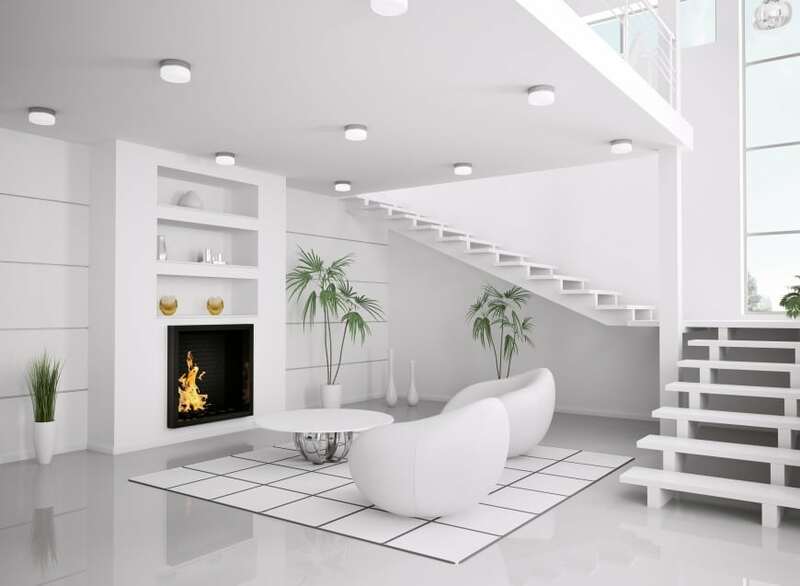 It is sleek and modern in appearance, featuring a polished floor, floating stairs, round-shaped furniture pieces and a large fireplace. 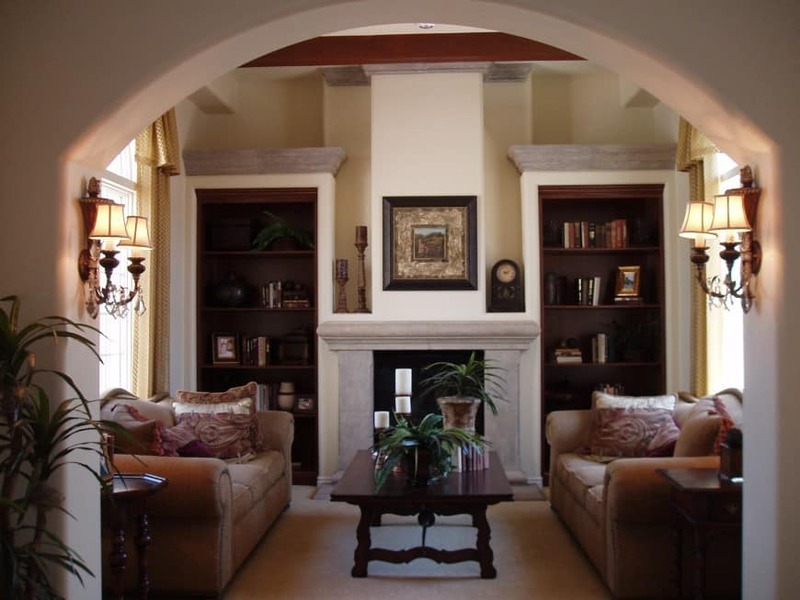 Here is a more traditional living space design. This cozy little room is furnished with a leather set of a three-seat sofa and an armchair, a wooden coffee table, a TV cabinet and a glass console table. 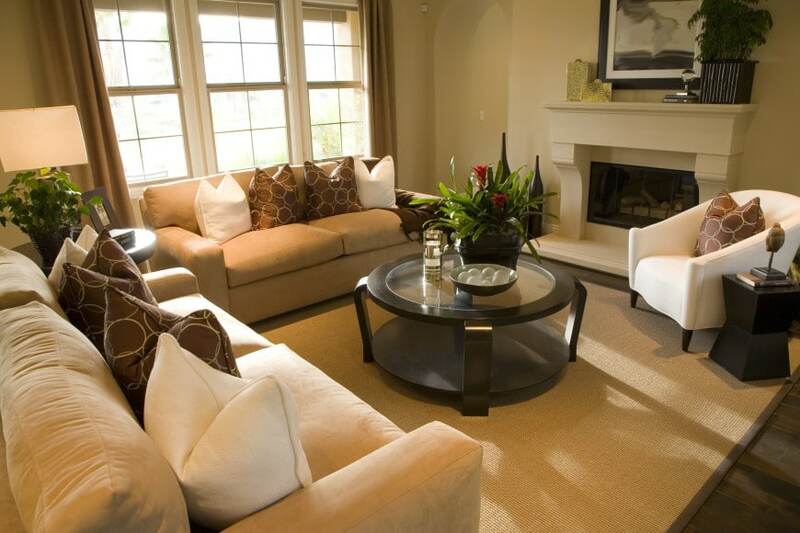 This contemporary living room design is set in neutral grey, beige and brown. 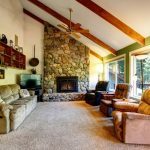 It has a stone-clad feature wall with a fireplace that stands out in the middle of the room, and a sitting area complete with modern furniture pieces.